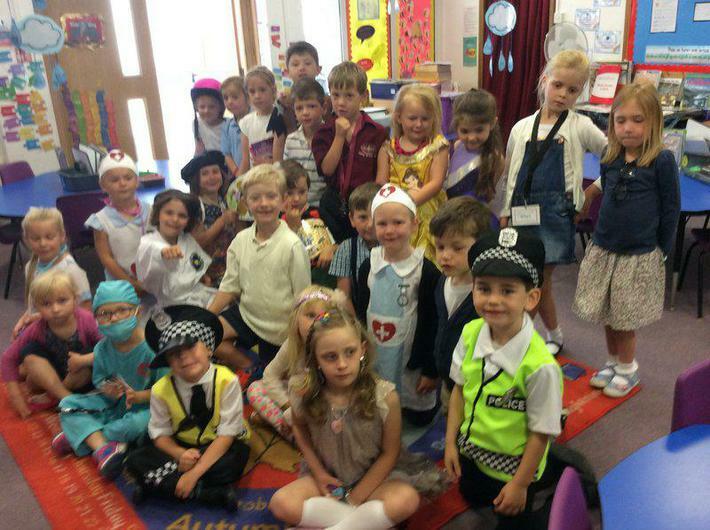 Please find attached a photo of all the children dressed in their Aspire costumes for Big Me! day. Thank you to all funds received towards the ActionAid charity. Thank you so much for all efforts with Castles homework!! The models, posters and information produced has been absolutely brilliant and we enjoyed sharing and showing all the work today. Neil Lovejoy from Dorset Police visited the school and all the classes had a Road Safety Workshop with him and his colleague, John. In Year 1 we found out how to stay safe when walking and in the car when we must wear our seatbelts and not distract the driver! We went to Gore Farm. We found animal homes, hunted for natural materials, made clay owls and our own outdoor art. We also listened to the story 'Owl Babies'. We were lucky enough to have special visitors in our classroom today from 'Something Else Fishy' to help us make some healthy food using fish! We all tried some smoked mackerel and we made fish cakes using cod to take home to cook and have for dinner! We learnt about how fish is good for our bodies in lots of different ways and how we can have fish as part of a balanced diet too. 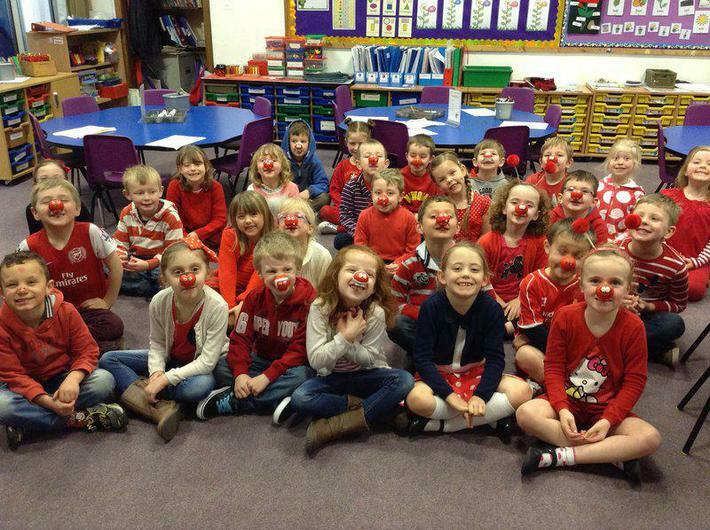 We all wore red clothing and some of us had red noses to wear for Comic Relief on Friday 13th March, we all had a super day raising money and awareness for other people who need our help! We were invited by Belinda and her Mummy and Daddy to visit Dikes and looks at all of the fruit and vegetables they had to sell in their store! We were very lucky and got to try lots of different kinds of fruit and vegetables that we hadn't tried before and learn new things about them too. We are going to make some pictures using fruit and vegetables to send to Dikes as well! We had a very busy afternoon planting in Foxes Class, Miss Elseworth came in to help us and we planted sunflowers, potatoes, tomatoes, lettuce and different types of flowers. We had to use soil and water to help the seeds grow and we will be watching them carefully to see what will grow first! Eric the Knight is in a pickle! We must be the most helpful class in school at the moment as lots of interesting characters have jobs for us to do! Eric the knight needs a new shield and we have been trying to find a good material for him to use that will keep him safe when he defends his castle! He needs a strong material that he can carry into battle that isn't magnetic as the enemy has a big magnet to steal the knights shields! We tried to sort our materials into two groups using a magnet to see which materials would be better for Eric. We have been thinking carefully about what makes a good friend and looking at Jesus to help teach us how to was a good friend to everybody. We have learnt a lot, and that sometimes it is not always easy to be a friend. We freeze framed parts of the stories we have heard about Jesus to show how he was kind and caring to people even if they weren't kind to him to begin with. We have been given lots of special missions from the Giant this week to make sure that we are excellent at measuring and weighing! He asked us to measure our feet using different tools and to weigh his belongings so he knew which bag to use so he could carry his shopping home! We think he is a little bossy but we now know how to weigh carefully and measure accurately too. We had a great walk around Stalbridge on Friday. We learnt about lots of old features, used our geography vocabulary and thought about what we like and dislike about where we live and go to school. It was great fun! All the children were so well behaved and a pleasure to take out. Well done! This sign says Foxy, we are called Foxes class. We know what this is for! What can we learn about this building? We know how to keep safe! Well done everyone! We have had a great start to Year 1. We are always busy with activities. We love playing doctors and treating the patients with our ever growing knowledge of the body. We love the chunky pens.. It is all about team work! Waiting patiently to see the doctor.. The doctor will see you now.. 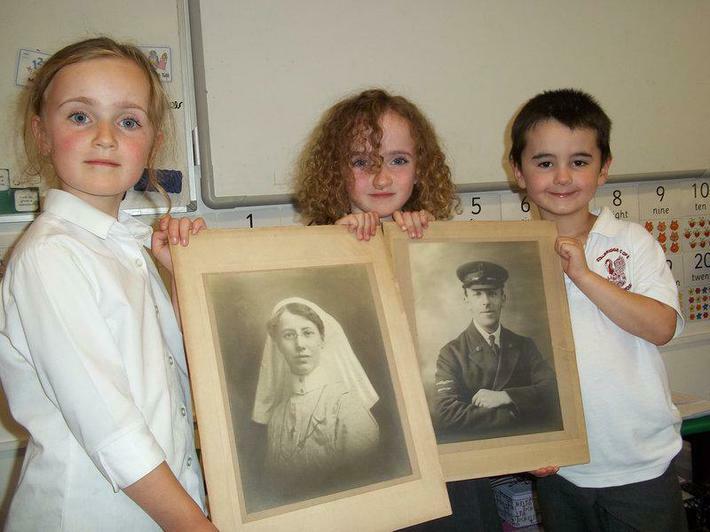 Here are Caitlin and Jenna sharing pictures of their relatives from long ago! Amazing! Thank you to Ivo for helping to take care of the pictures. We had a lovely morning getting used to Year 1. We found out that there are lots of exciting things to do. Here we are having fun! Showing off our great writing! Trying out our dressing up sets! We have had an exciting week in Foxes class, settling in to our new classroom, new routines and meeting our new teacher. We love our Foxes Den..
Well done Woodpeckers class, we have had a fabulous first week with you. You have settled in to KS2 really well and we have enjoyed working with you. Keep up the good work! We had great fun at the Zoo as part of our whole school expedition to Bristol. Take a look at some of the animals we saw and some prehistoric ones too!!.... Thank you to Mrs Perrott and Mrs Phillips who helped our class throughout the day. We began our healthy eating week with a treat of having a class breakfast on Tuesday morning. One child commented on 'how lovely to have breakfast with my friends'. On Wednesday we had a Kiss Fitness circuit session including press ups, star jumps, spotty dogs and jumping over a rope. We also did our own jumping Mexican wave which was great fun. Thank you to Nikki and Dan as we all really enjoyed it. We finished the week making fruit faces on plates and then enjoyed eating them! We used nectarines, grapes, cucumber, tomatoes, apples, bananas & satsumas. We have introduced a new topic in Literacy and started with Olivers Vegetables. The children have been sequencing the story, creating tissue paper settings, discussing characters and our role play has become a garden centre. In Numeracy we have been learning to count on in 2s, 5s and 10s. During this week the children have enjoyed World Book Day - they were divided up into mixed year groups and then visited different classes to produce a Bedtime Story Book. Each child contributed to the books whether it was illustrating, ideas for characters, settings or writing. It was great fun and some fabulous books were created. All the children and adults enjoyed a day in pyjamas, dressing gowns and slippers. This week we have been looking at Chinese culture, had a Chinese restaurant as our role play area, decorated a dragon and made a lantern, wrote our names using Chinese writing, as well as our usual phonics work. Our numeracy has been balancing, weighing and estimating. We have also started our stained glass window decorations using tissue paper - keep an eye on our classroom window! As part of our RE studies this term the children had a chance to look around our Church. This was an opportunity to have a good look around and to listen to lots of interesting facts. They also sketched stained glass windows. This term we will be looking at Fairytales in literacy and eventually writing our own versions of well known tales. 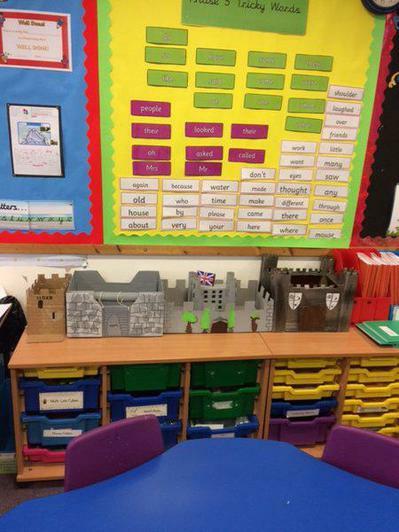 Our role play is a castle and we have princess costumes and knight outfits to dress up in. We also have a variety of masks and fairytale books to reinact the stories. This week the children have enjoyed our Christmas Literacy Carousel. This included the children becoming characters in Bethlehem in the role play area, designing Christmas cards with religious symbols and sequencing the nativity story. Numeracy introduced the Tens and Units of numbers. The children all made Christingles this week. Two were chosen be used at Church on Thursday morning for our fortnightly service. They had great fun putting the sweets and raisins onto cocktail sticks and then adding the candle. For the last 2 weeks we have been looking at Animal Poems. The children have composed their own or group poems with their favourite animals as topics. They also designed planning sheets to subsequently construct an animal using junk modelling. In their literacy books they had to draw and use descriptive language using pictures, brought in from home. Our role play became a vets. We have been looking at the Noahs Ark story in Re and creating our own prayers. We have also been looking at words with the 'i' and 'o' sounds. Numeracy has been counting in 2s, 5s and 10s and halves. Literacy has been on a dinosaur theme. Each Friday the children enjoy mixed group activities with a fruit theme. These are rotated each week - ICT, Sewing bean bags for us to use in class, tasting and describing fruit, collaging fruit shapes for a window mobile and word searches. Take a look at our progress..... Thank you to Mrs Perrott who helps us with these activities. This half term we have been looking at Jurassic Britain. We have explored non fiction books, found out fascinating facts and even written our own information pages all about our own Dinosaurs in literacy. What shall I draw? The children drew, planned and wrote poems based on this original poem. This week in class we have been looking at the sounds: ear, air, ure and er and words that contain these sounds. In Numeracy we have been studying basic shapes - 2D and 3D and topic work has continued with the senses. See a selection of photos throughout the first week in our new class. The children have been very busy and settling in to a new routine which has been excellent. They have been introduced to the Literacy Carousel, Numeracy, Guided Reading activities, Role play - travelling theme, All About Me and topic work. 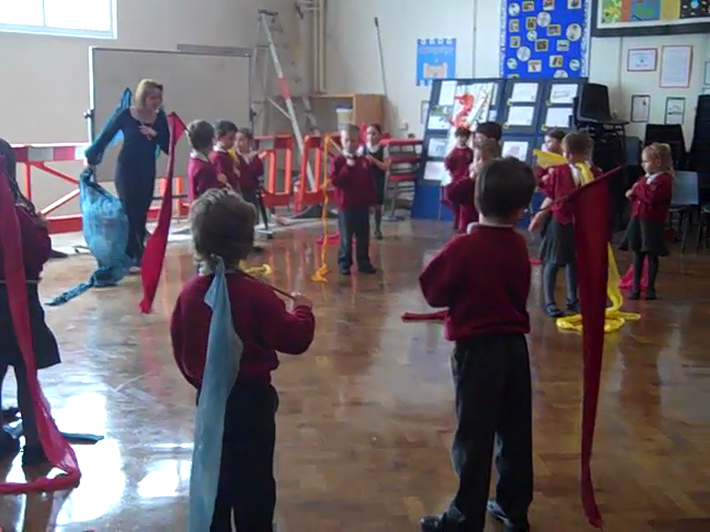 Thursday 5th July Year 1 children joined in with a whole school poetry morning on an Olympic theme. Each of the children had to use an Olympian or Paralympian to create a poem. Parents or a family member were also invited in to work with their children. A great time was had by all and some fabulous poems written. On March 30th 2011 we did our class assembly on China. We have learnt lots of information about China and practised some dances. Here's a video of our dance. We had a great afternoon pond dipping.